It's been all about Santa today, as it should be because it is vital to our ongoing survival, with his train receiving last minute attention to ensure all the heating works and a sound test of our new in coach sound system. Cleaning of the train has benefited from the LCC as we prepare for next week's decoration and preparation of Santa's on board grotto. All those groups that now reside on our site should be well aware that this singular part of the year allows them to enjoy their hobby and participation in delivering a great experience is key to our continued future. The dmu team continued with repairs to a cylinder head on Iris and the lone LMSCA worker made further progress with the north end of their Mark 1 BSK. 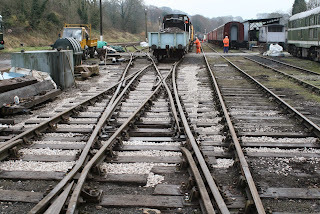 The PWT tended to an unpleasant track joint on the Car Park Siding with a little packing in the surrounding area. They also recovered some equipment from bridge DJW 17 after the repair work there. The Booking Hall processed yet more Santa bookings and I am happy that this year's financial take has now overtaken last year's total. I couldn't find an appropriate photo in today's gloom but my mind turned to the tiem when Tube Lines were with us illustration the changes at Shottle from 2007 and we just couldn't go any further with this 60 tonne vehicle. 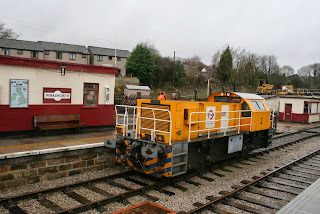 The Schoma diesel also visited as part of this project and may return if the gods are with us! 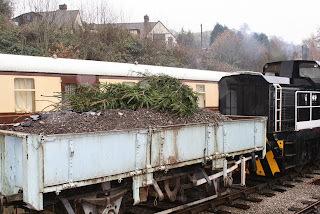 It's nearly upon us - the Santa Season so today saw the Christmas Tree and the genuine North Pole delivered to their destination that is quite oddly somewhat south of Wirksworth. It was slightly demeaning for the Norwegian Spruce (or looky-likey) to be transported on top of a lowly wagon load of spoil! 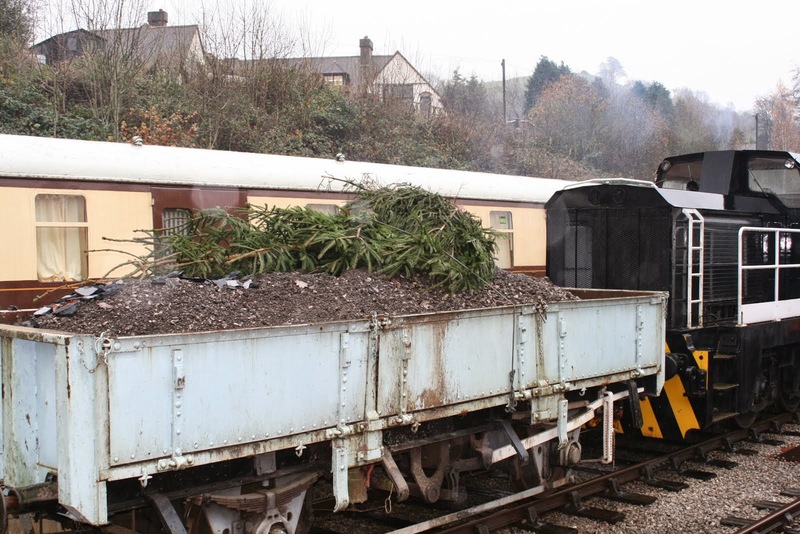 In addition to this critical delivery the PWT had the opportunity to dispose of surplus wagon stock at Shottle and collect two flat wagons one of which was back loaded with logs for Wirksworth. Mike Billings followed the Works Train and managed to achieve more flailing in what was an extremely bleak and damp day. The "Bubble Car" that will be the PWT's main transport received day 2 of sandblasting and was moved into the Maintenance Facility for undercoating at the end of the day. During the day the dmu team shunted all the vehicles out of the way of this last move. The Santa Coordinator and LCC together with long suffering husband made progress in the Training Room with present assembly and coding after being comforted that several areas of concern were under control! The Booking Hall was again pleasantly swamped by Santa bookings requiring quite an administrative effort. 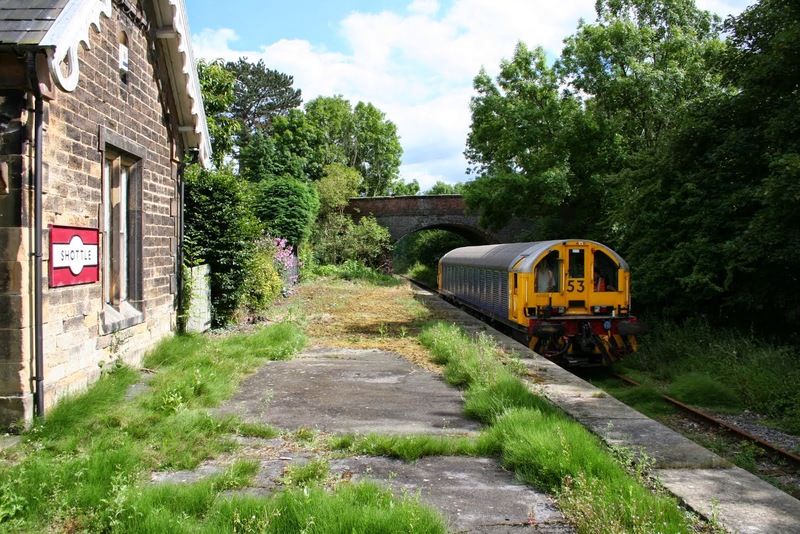 PPS - Funds for the Permanent Way Team's splendid new transport are a little slow to come in and I have taken quite a punt to spend £700 on its sandblasting preparatory to a basic undercoat. If you can help with this very worthy project which will help keep this vital team in business your contribution would be much appreciated. 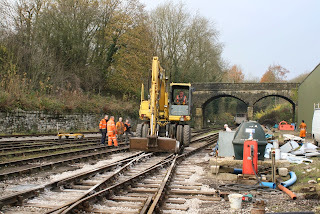 A great deal of activity today with the PWT achieving a tremendous success in "jim crowing" the point blades at the north end of the single slip to achieve conclusion to this complex project. They deserve a great deal of praise for this work and I wonder what the next challenge might be? The team also discharged the remaining ballast into the track relay past the former "dust dock" which brings this area nearly up to standard - I am sure the white gold fairy will visit again! The VCT reported a 7 man team split into two groups with one achieving a further 70 metres of sheep fencing in an area of very hard going and the other cutting and burning with two fires in the area of MP 134 1/2. The dmu group spent time cleaning the east side of one of our new arrivals, the unique Derby Lightweight two car set. We may be considered foolish in accepting another challenge but this set will really provide us with high quality vehicles that will set the standard for the foreseeable future. The PWT "Bubble Car" received day one of sand blasting and great progress was made to move this vehicle towards painting. 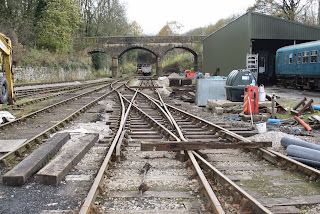 The LMSCA worked on their BTO and Mark 1 BSK and the DST painted wheels on No3, prepared spaced plates for new buffers on Hnery Ellison and made further progress with Cathryn's footplate. Stewart machined parts for Cathryn and steam heating components for the LMSCA. The Booking Hall processed a most satisfactory number of Santa bookings and also trialled the new music system for the Santa train. A bitterly cold day, the first of the winter, which saw a good frost this morning. Numbers were thin on the ground today but there were still some exciting things going on around. The LMSCA were in continuing apace with the rebuild of the BSK's back end. It is quite impressive to see all of the new metalwork going in, especially with the thickness of some of it around the corridor! This morning, we welcomed negotiations with a test customer. All was very positive so we'll see what happens! We also welcomed, finally, the Derby Lightweight power/trailer set. The set forms what we believe to be the oldest surviving DMU built by British Railways in 1954 and it is great that all three remaining vehicles of the class can be together once again, and so close to home. 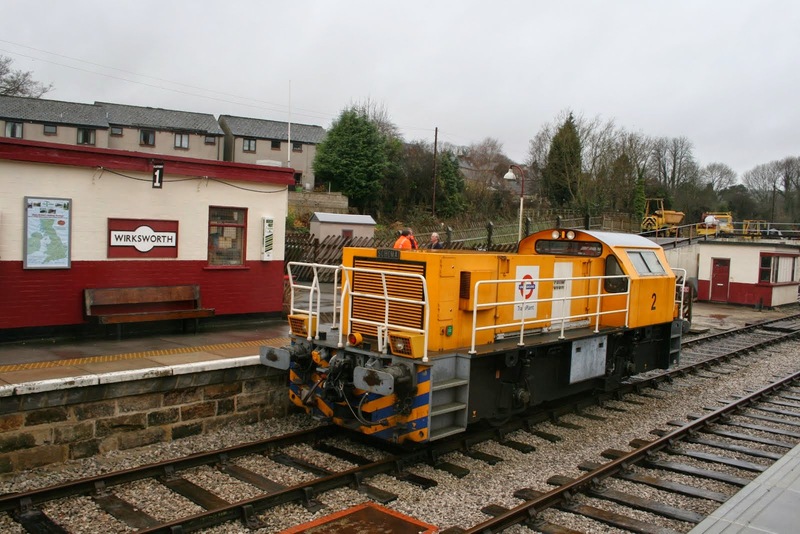 The power car, Driving Motor Brake Third M79018 received a considerable Heritage Lottery grant to enable it's restoration, which was completed around 10 years ago. The vehicle popped over to the Railcar50 celebrations at the Severn Valley Railway, being the oldest representative which was actually 50 at the time. Now exactly 60, the vehicle hasn't carried any passengers and needs some attention now it has sat for 10 years waiting for the partner to be completed. The vehicle needs modifications to the wiring as it was completed to the original Yellow Diamond multiple working specification which means it can't work with other units. It is planned to convert this in a similar way to 'Iris' so that it can. The trailer car, Driving Trailer Composite Lavatory, is a shell inside but has already had considerable work done to it and has been wired to Blue Square multiple working specification. 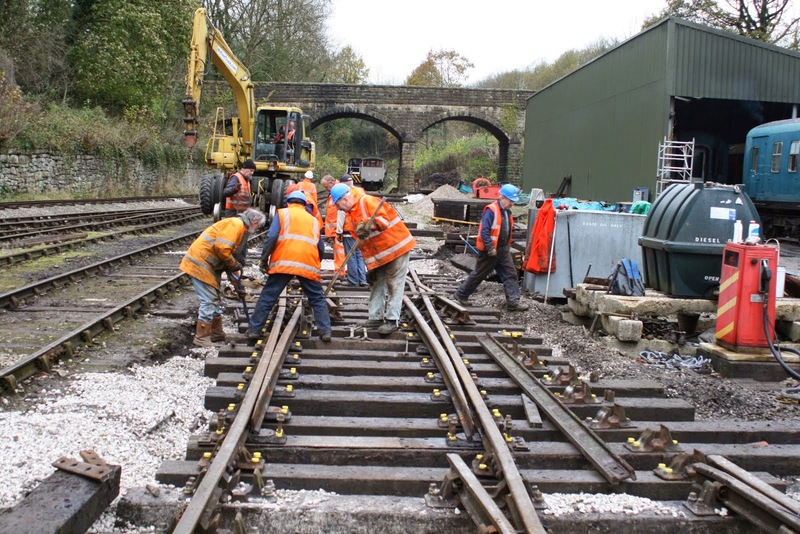 Serious restoration work isn't likely to start soon but once they're complete, the railway really will have a special product! More details at www.e-v-r.com/stock . 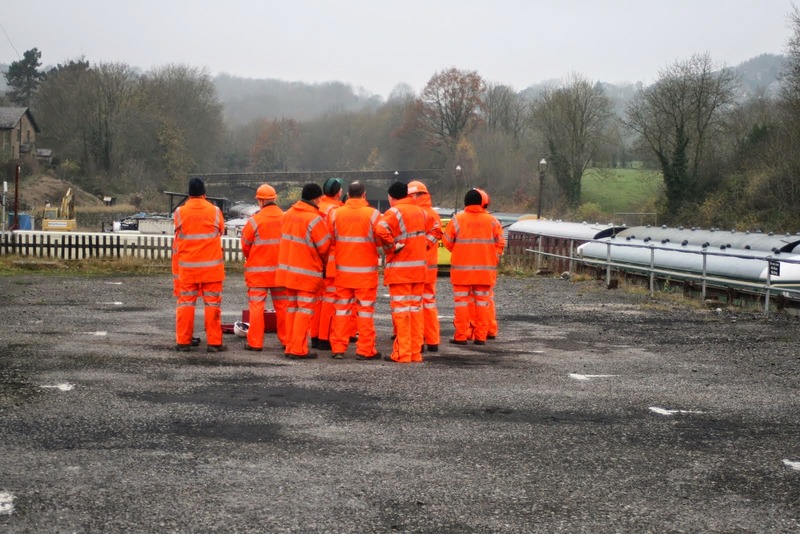 It was the Rail Accident Investigation Branch's Training Day at Wirksworth and part of their mission was to explore the capabilities of a drone acquired from the Air Accident Investigation Branch. 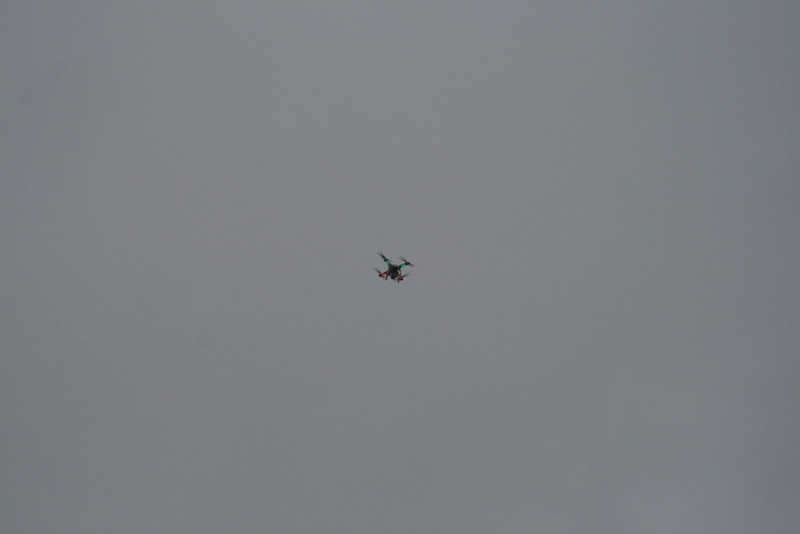 The pictures show some of the RAIB team and the mystery flying object. The LMSCA continued their refurbishment of the north end of the Mark 1 BSK as it is prepared to support next year's initial catering train. Today also saw the arrival of an LMS Stanier 12 wheel sleeping car which will be converted, over time, into a splendid 54 seat dining car. 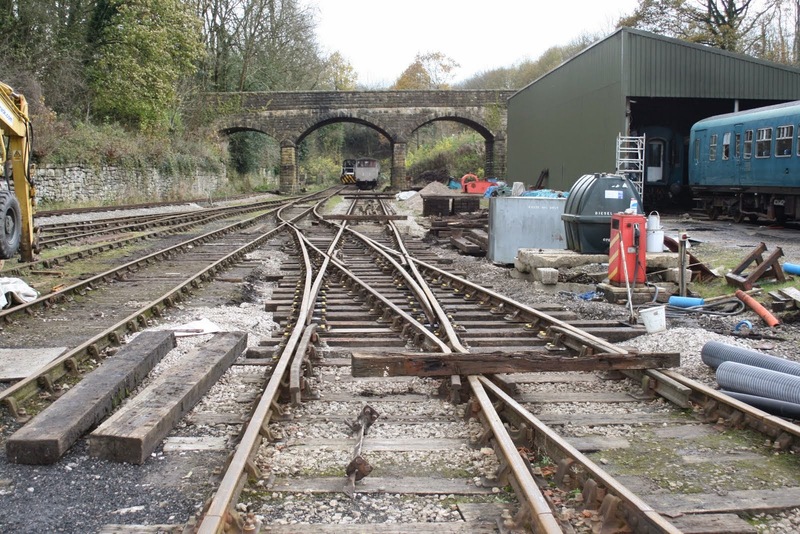 The LMSCA have been extremely ambitious with this project which eventually produce something that will be truly unique to our Railway. The Booking Hall has continued to deal with unprecedented demand for Santa trains with sales so far this year being some 39% in advance of 2013. It looks as though our season will be quite spectacular! It was good to welcome Mick Thomas back into the fold as he awaits attention to his knees. 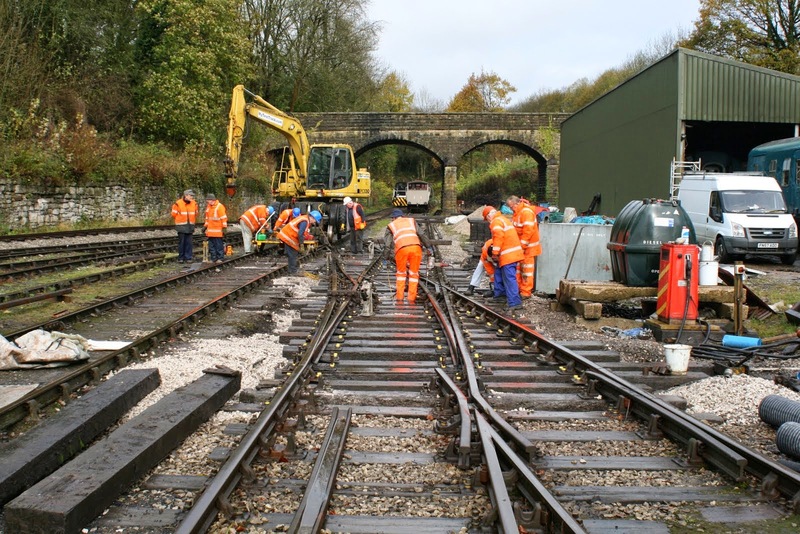 His technical expertise will be invaluable to moving the track remodelling forward necessary for the Maintenance Facility extension project. The PWT came out in force to complete the single slip rotation and Phil is pictured with the first test run over the new work. The video shows Phil and Mike Evans testing and allowing the work to be signed off all bar a little work on the northern most point mechanism. My sincere thanks go to Phil Tarry who has been with us over the three week period from his distant residence in Devon. We should give three cheers to all the people that participated in this complex work and ensured the project was delivered within the set timescale. The dmu team continued with readying the three Santa train vehicles to ensure they deliver at the critical time with a warm, toileted and clean environment. 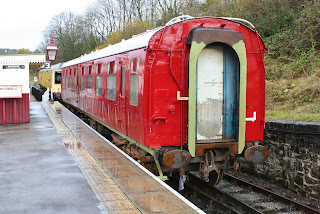 The Bubble Car 55006 was prepared for action on this week's Saturday services. The LMSCA expended a great deal of energy on their Mark 1 BSK which is gradually being welded together again. The Booking Hall concentrated on Santa which continues to be pleasantly filling. We welcomed back Amey who completed bridge inspections between Idridgehay and Jebbs Lane as they work through our annual inspections. Fred and Iris gave the Mess Hall their usual high quality hygienic treatment and I am pleased to say that the teams seemed to have maintained the standard to the end of the day - marvellous! The VCT team of 8 achieved a World record of 200 metres of sheep netting erected as part of our agreement with the NFU - a truly remarkable piece of endeavour. The other part of the team dealt with further incursions of blackthorn which is not an enviable task! The PWT, pictured, jacked, packed and snagged the single slip pointwork that has been remodelled. They were out in force and tomorrow should see this project put to bed. Graham and Roger have been attacking the poor visual state of the fencing and gates of Idridgehay and commenced the long process of preparing this area for repainting. The dmu team have been working on the roof of 50599 to remove the remains of the BR applied bitumen based covering so that this vehicle can be made presentable again. 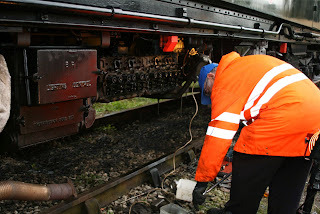 The DST were fitting sandboxes and tending to the footplate metalwork on Cathryn. Angela has been top and tailing our accounts for the year ending 31st October and it was good to see Izzy and Natalie back from their tour of the southern hemisphere. There is a mystery surrounding the loss of 7 tablecloths from our VIP luncheon equipment - any ideas? At £12 each it's quite annoying. The Booking Hall continued processing a steady stream of Santa bookings and agreed to work with a new leaflet distributor that will widen our penetration of the market for 2015. The main thrust of activity today was on the slip relay project in the yard. 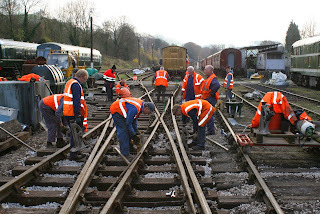 A small Permanent Way team worked their socks off today screwing the track down largely by hand as hired in mechanical assistance didn't arrive. A day of packing and levelling tomorrow, followed by connecting the levers, should hopefully see this project conclude late Wednesday (with a fair wind). They're off for a soak! The Booking Office continued to process a steady stream of Santa bookings with some of the trains getting tight. The website shows the status of each train, with two yellow and one red at this moment in time. Another is about to go yellow shortly. The LMSCA continued work on the rear end rebuild of the Mark 1 BSK also. A miserable day which still saw good passenger numbers. The train was loaded with VIPs for lunch as well as a birthday party. The 8F group continued their work and so did The Duke team. Work also continued on the BSK by the LMSCA. 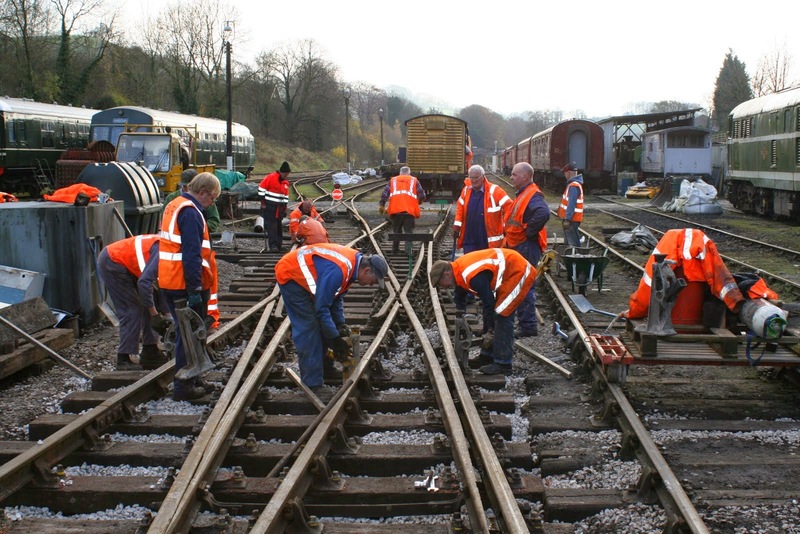 The DMU Group were out in force moving large components from external storage to dry store. 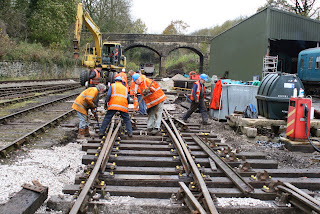 The first photo shows the achievements of the permanent way team this week who have completed all the rail installation yesterday for the single slip project and will devote next week to fastening it all down and reopening the finished product to trains again. The second photo shows the work going on to deal with the cylinder heads on Iris. 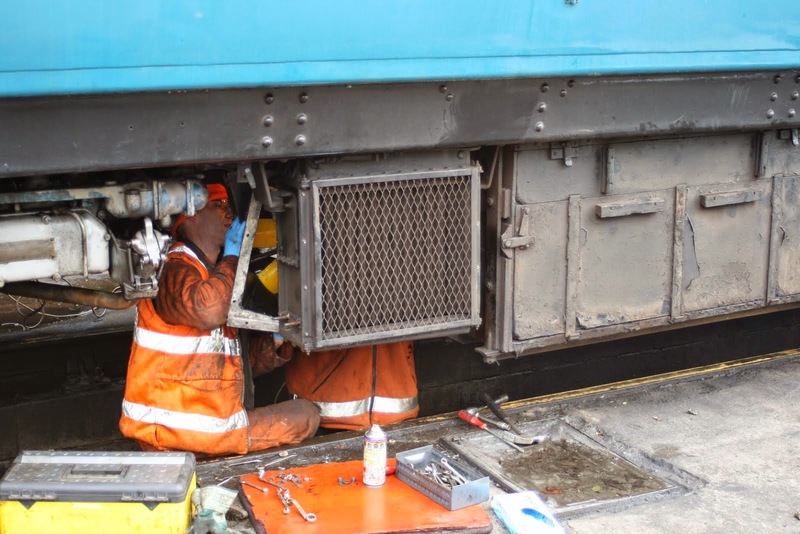 The dmu team also put effort into the three car set that will be our Santa train with a new fan retrieved to correct a problem on 51188 and tended to the batteries on the centre car. The LMSCA continued with surgery to the north end of their Mark 1 BSK and the M1M reported completing the restoration of the battery box on their SO. The work on the Santa train has never been more valued as the Booking Hall reports a 29% growth in sales compared with this time last year together with dealing with our second coach operator booking for 2015. Amey have been out and about again for their annual bridge and structure inspection. 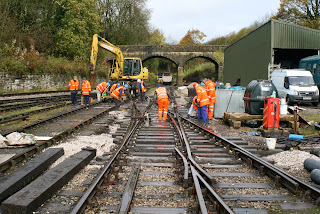 Our heroes today were the PW Team who braved the most unpleasant weather to move the single slip project forward. All the machine assistance failed or was intermittent in performance but at the end of the day all the metalwork was in place and a start was made on screwing it down to the sleeper supports. An impact wrench has been hired for Monday which will give some security that the task can be completed by close of play Tuesday. The other photo today shows the EVRA SK following a basic repaint by Lee Sharpe who is now turning his attention to the roof of the Railcar Enterprises support vehicle. The LMSCA battled on with the north end of their Mark 1 BSK which continues to receive major surgery. The dmu team of one, Joe, started to give the three Met-Cam vehicles that will form the Santa train a full service and I was in error yesterday as vehicle 50599 has been put in the Maintenance Facility for attention to its window seals. The Booking Hall continued under the weight of Santa bookings which is really showing the strength of this year's offering. Santa Co-coordinator, June, was quite surprised to receive extra presents to her order which seem to be "booties" for the new born. Nonetheless they will be taken into stock waiting an event. Some 67 boxes of next year's timetable brochures also arrived requiring physical exertion to take the into stock. It is difficult to award today's winning team accolade. The PWT, pictured, achieved amazing progress with all sleepers and metalwork positioned as part of the single slip project. There remains two small closures to be dealt with tomorrow and screwing down of the new layout. This is tremendous as it represents the most difficult challenge for the team so far. Equally, the VCT had a turn out of 9 and split themselves between fencing and blackthorn clearance. A record 100 metres of sheep fencing was erected as part of our agreement with the NFU. This is nothing short of magnificent and reflects great credit on those involved. Farmers and train crew should be very happy although farmers never display happiness. Fred and Iris returned to thoroughly cleanse the Mess Hall and the LMSCA gave further attention to the guttering on their TO. The Booking Hall continued to process a welter of Santa bookings - it is all most gratifying as this year looks set to break all previous records. A very pleasant and rewarding day if slightly damp. Bitterly cold in the Gem of the Peak today where once again the main push was on the slip reversal in Wirksworth Yard. For day 4, the team are doing remarkably well with new timbers being laid in position today and a start being made on installing the metalwork! Fingers crossed for another great day tomorrow. Nearby, LS Engineering completed his part of the EVRA SK and the LMSCA continued working on their BSK. The Elves arrived in the Booking Office to find a flood of Santa bookings from the weekend. Things have raced along this weekend and one or two trains won't be far away from going amber on the website now. A very wet day down at Derbyshire's favourite branch line but our three Duffield services still achieved good passenger loadings. Today's planned LMSCA coach delivery from north of the border has been postponed for a couple of weeks for reasons out of our control. It was good to welcome 'Vince the Elder's' daughters who visited us to donate some of their dad's tools and PPE. Down the yard the LMSCA focussed their efforts preparing the interior of the T.O. for further work. 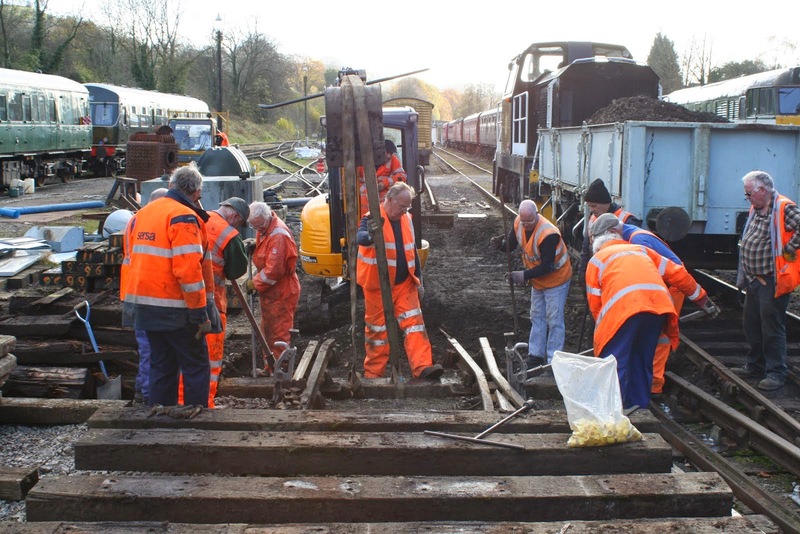 The DMU team removed the seats of 50253 and the 8F group plied their skills with 'the Duke'. The Buffet staff were out in full force catering to the needs of 32 Amazon Customers who, despite the weather, were most complimentary about their visit. Finally, the booking hall dealt with various Santa related activities and the Association held their Annual General Meeting in the Red Lion Hotel this afternoon which was well supported. A day of the most foul weather, even by our standards: cold, wet and unspeakably awful. The LMSCA received some fine quality steelwork to repair the north end of their BSK and Sharpe Enterprises attached some paint to the EVRA SK in the relative dryness of the shed. The Station Foremen carried out repairs to the platform 1 footgate and fitted a new Parkhurst to the north end of the Training Room in order to light up passing cats in the wee small hours. They then retired for the duration having been drowned in the process. The Parkhurst is activated by a motion detector and when Spank, the station cat, passes on his midnight patrol the Parkhurst will come on for five minutes. This process was tested by the Duty Manager in the gathering gloom and several new puddles were discovered on the way: Duty Manager's socks are now drying on the Booking Hall radiator. We welcomed back Amey today as they undertake their annual bridge and structure examinations which will carry on over the next few weeks. Network Rail returned for their penultimate day of endurance testing ably hosted by Tony Watt. 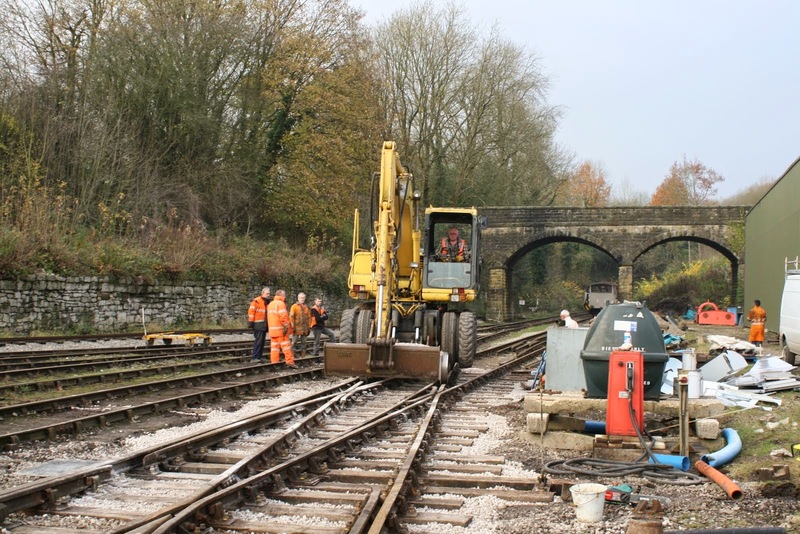 Rodney continued to add material to the Duffield Road Rail Access Point to aid the turn round of the vehicle there. The dmu team started to work on the cylinder heads of "Iris" and continued the "winterisation" of the fleet. This Saturday's two car set was checked and readied for service. The LMSCA concentrated on the replacement steel work for the north end of their Mark 1 BSK and the M1M worked on reconstructing the battery box on the EVRA SO. Painting of the EVRA SK continued apace in the Maintenance Facility. I was good to welcome Mick Thomas who has been having a torrid time whilst his knees are examined by the medical profession. They have decided he needs a major overhaul and will enter the works in 18 weeks or so. In the meantime he will be manufacturing the necessary parts of Shottle Loop ground frames. 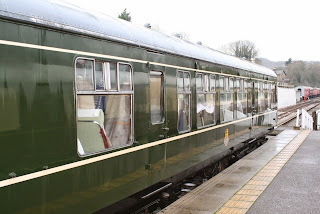 The Booking Hall continues to concentrate on the 2015 web site offers together with this year's Santa bookings. The last post from Manchester with trams, a Class 66 and a Class 92! The great track reconfiguration proceeded apace with a one day hire of a mini digger and driver to prepare the track bed and ensure the drainage in the area was corrected at the same time. A big thank you for the large team that turned out to support Phil as by the end of the day they had achieved the ballast base ready for next week's endeavours. 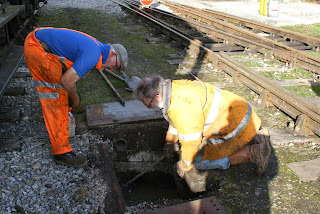 The photos show the scene partway through the day and two of the team looking down a hole. Vince Morris did achieve a great deal of drain rodding though! The dmu team finality bottomed the replacement head on one of the "Bubble Car" engines and now are concentrating on an oil change to restore the vehicle back to active service. The LCC had Christmas on her mind and further preparation and tweaking was agreed. The LMSCA tended to the last of the guttering on their Third Open and continued to progress the BSK. I mentioned John Rhead's attention to the guards documentation and should also thank Michael Perkins who is knocking all the literature into shape. The Booking Hall processed more Santa bookings and spend a great deal of time preparing the web site to reflect our wares in 2015. A cold, sunny day with much further progress. The season may have all but ended but in a most unusually pleasant day further progress was made with our permanent way challenge. The photo illustrates we are now committed and I welcome Phil Tarry back to the fold for a guest three week appearance to mastermind this challenge. I thank all who came out to help in this major work for our enterprise. The VCT have returned to their preferred Tuesday activities now that there are no service trains and split into two groups the first of which started the great fencing enhancement project agreed with the Nation Farmers Union while four of the group tended to vegetation clearance in the area of milepost 134 1/2. The dmu team spent further time on one of the engines of 55006 where the cylinder head studs are proving to be quite a problem and a team of two started to refurbish the main flower bed woodwork on Platform 1. The DST were out in force tending to Cathryn's wheel painting, fitting steel plate that will support the bunker and positioning the first reconditioned spring for refitting. Again shown in a photo. 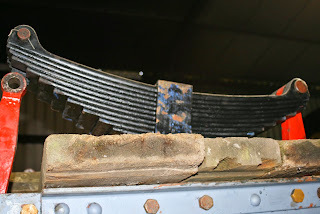 Other parts of the team continued to attend to Henry Ellison's buffing and drawbar gear together with draining No3 of water. Fred & Iris gave the Mess Hall their usual attention together with further work on the Wirksworth station planters. John Rhead has put in a great deal of work, which was reviewed today, to ensure we can demonstrate the competences of our Guards. It's all very necessary to satisfy our Safety Management System and it is satisfying that we are in good order! The Booking Hall processed Santa and experience courses together with the web changes needed for 2015. Winter has arrived! …and today's test machine knew about it. 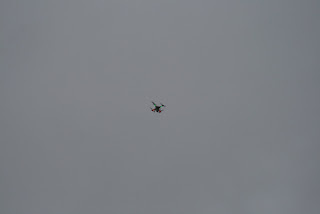 Our customer was ably hosted by Mike Evans today but despite best efforts, the machine today was moody at times. 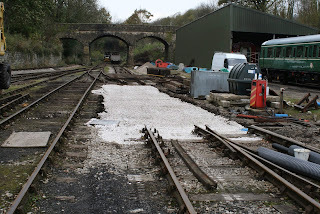 Said mood swings slightly delayed the Permanent Way team with starting their latest project, to reverse the slip in the yard to make life easier when working the yard at Wirksworth. 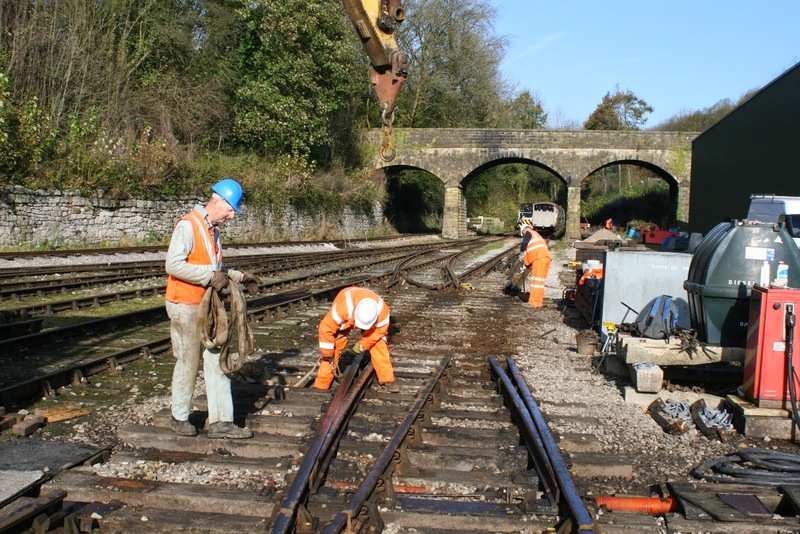 This project, scheduled to last around three weeks, is part of an overall scheme of improvements to the layout of the yard and will take great effort. The delay didn't seem to phase the team too much as they really cracked on this afternoon and managed to unclip virtually the whole point ready for more major work tomorrow. The yard is now in two. Stock on the pit road and the WC road can be moved around on that side of the yard with access to the incline. Stock on Road 3 (Pullman) is currently marooned. Stock on the car park/steam/carriage side of the yard has no access to the Maintenance Facility or the incline but can go to Duffield or the platforms via Road 1. The point between Road 1 and the slip is clipped to prevent use. The service train for November Saturday services is stabled behind the stop on Road 2 but MUST be left far enough north to enable the LMSCA to access the BSK easily. Elsewhere today, LS Engineering continued the beautification process of the EVRA SK and the LMSCA continued work on the BSK. Once the structural work is completed there are great plans afoot for this vehicle! The Booking Office was too in go mode with much preparation for next year. 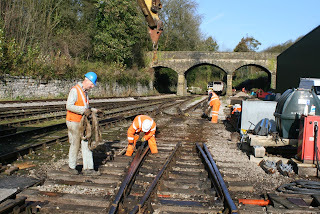 The first Sunday of the year without a train service saw us busy around the site with many small working groups. The Passenger Department was occupied with the annual stocktake and with Santa preparations in the Training Room. The Duty Conscript devoted himself to scrubbing the exterior of the Mess Room clean of its annual moss accumulation and Roper Scrubbers did the same to the rather green side of the EVRA shop and the back of the Information Room. As the afternoon was tolerably dry JCB Purves threw the paintbrush at the weighbridge, which has become rather tatty during the summer, if the weather is dry it will get its topcoat next week. Down the yard the Austerity Team carried on with scraping and painting and nearby Smith's Industries carried on with his veranda. 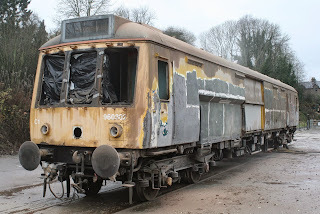 The DMU team finished painting the black ends of the DMU support coach, continued a C exam on unit 50599 and painted the toilet framework of unit 50170.
up yard with stock movements for forthcoming point alteration. On arrival home it was out for the Evening.Most trains were pleasantly loaded and were supported by the Pullman Buffet and their Afternoon Teas,model Railway and EVRA Shop.The LMSCA continued to remove the Tinworm from the North End of the BSK.Tim Oaks and the 8F Team continued with their restoration of The Duke. Please be aware from Monday Road 1 has now become the running line from Cemetry Lane to Gorsey Bank/Duffield. Road 2 has become a storage Road. LMSCA and EVRA coach restorers please note.